-Green flag (start): How do we start our journey of faith? -Yellow flag (caution): The decisions we make can sometimes put us in danger. How do we learn to heed God’s caution? -Red flag (delay): Finishing well involves pit stops. How does God help us get the most out of these breaks? -Blue flag (yield): Each of us may run our own race, but we also need to respect others. How does God help us focus on others’ needs? -Black flag (disqualification): What happens when our own violations take us out of the race, and how does God help us get back in? 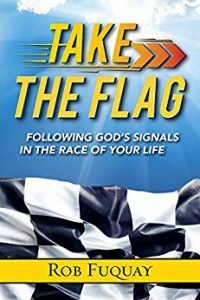 -White flag (final lap): As we head toward the finish line, how do we steer according to God’s will? -Checkered flag (victory): If we persevere—navigating the hazards, managing the pit stops—then victory is ours. But how does God want us to experience victory?